Three Johns Hopkins engineering students have won a $15,000 prize in a national sustainable development competition for adapting a traditional Korean paper-making technique into an inexpensive way for impoverished villagers to produce paper for schools. The prize-winning team members from Johns Hopkins were, from left, students Sangkyun Cho, Victor Hyun Oh, Jay Hyug Choi and faculty adviser Erica Schoenberger. The prize was presented recently in Houston during a ceremony honoring the top submissions in the 2012 Odebrecht Award for Sustainable Development competition, which attracted 422 student entrants from 173 universities. 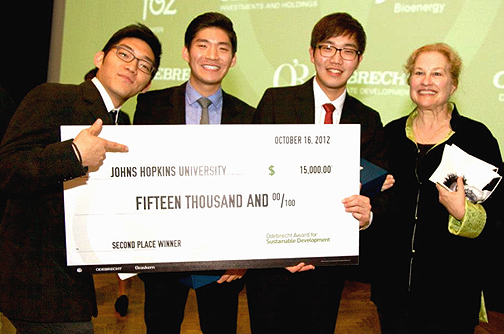 The Johns Hopkins team’s paper-making proposal won the $15,000 second-prize. The funds will be shared among the students, their faculty adviser and the school. Students Sangkyun Cho, Jay Hyug Choi and Victor Hyun Oh developed the plan last spring to fulfill a class assignment in a Whiting School of Engineering course called Introduction to Engineering for Sustainable Development, taught by Erica Schoenberger, a professor in the Department of Geography and Environmental Engineering. Student entrants in the Odebrecht contest were required to develop and submit a paper on possible engineering contributions to sustainable development. The Johns Hopkins students focused on the lack of basic school supplies, including paper, in developing nations such as Ethiopia, where more than 70 percent of the population is illiterate. “Stationary supplies are simply too expensive for millions of families that live on less than two dollars a day, and this is one of many socioeconomic factors that contribute to plummeting elementary school attendance rates and poor learning environments,” the students wrote in their entry. To remedy this, the three students drew on their Korean heritage to modernize a traditional Korean paper-making process for use in places such as Ethiopia. The students prepared a detailed design for a low-cost paper-making device that requires no electricity. The machine grinds up agricultural waste such as grain husks and mixes the material with water that is boiled over a fire. The resulting pulp is dried on racks to form paper. Oh completed his undergraduate studies last spring and is now pursuing a master’s degree in the Department of Chemical and Biomolecular Engineering. His teammate Cho is now a senior, majoring in chemical and biomolecular engineering. Team member Choi is a junior, majoring in applied mathematics and statistics. Photo of the student winners and their adviser available; contact Phil Sneiderman.